Take a cooling boat trip on the Chao Praya river or canals and enjoy the beautiful sights of Bangkok. 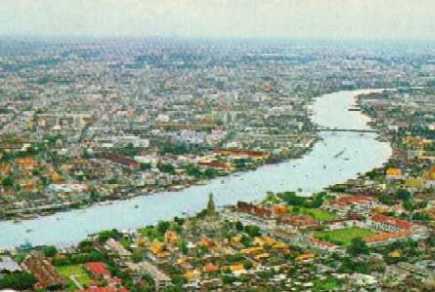 Regular boat services run on the Chao Praya river. Just take the normal express boat and enjoy the beautiful sights of Bangkok, including many temples. The river also has quite a few ferry services to take you across the river. The most famous one is from the Tha Tien pier to the Wat Arun, Bangkok's most photographed temple. The khlongs (canals) show the backside of Bangkok life. Some khlongs have a regular boat service. A nice trip is from on the khlong north of Sukhumvit Road to the Golden Mount. One of the bridges is so low that they'll lower the frame of the boat to pass it. It is of course also possible to charter a boat for yourself. The Tha Tien pier is a good place to do so.